Pay with paypal or credit card and get the best places at first. How many products do you want to exhibit? Per product on "anuga halal market 2019"
per product 149,- EUR . Incl. 18,- EUR Bank commission. 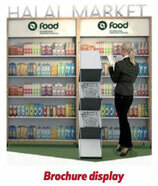 Deliver your samples directly to the stand (passage 2-4, Stand 008) on the 06. October 2017 between 10.00 – 17:00 o’clock. Two products on "anuga halal market 2019"
Per product 119,- EUR . Incl. 18,- EUR Bank commission. Three products on "anuga halal market 2019"
Per product 149,- EUR. Incl. 18,- EUR Bank commission. 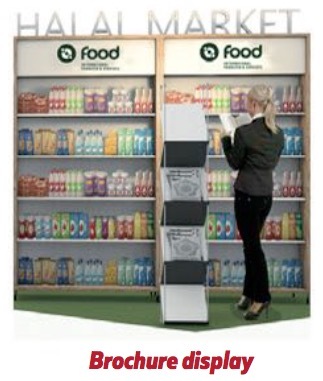 Brochure displaying "anuga halal market 2019"
Brochure Displaying on "anuga halal market 2019" (up to 250 pieces). 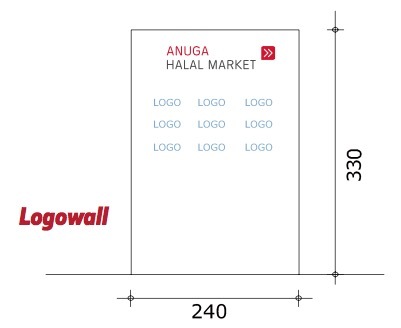 Logowall "anuga halal market 2019"
Halal innovation "anuga halal market 2019"